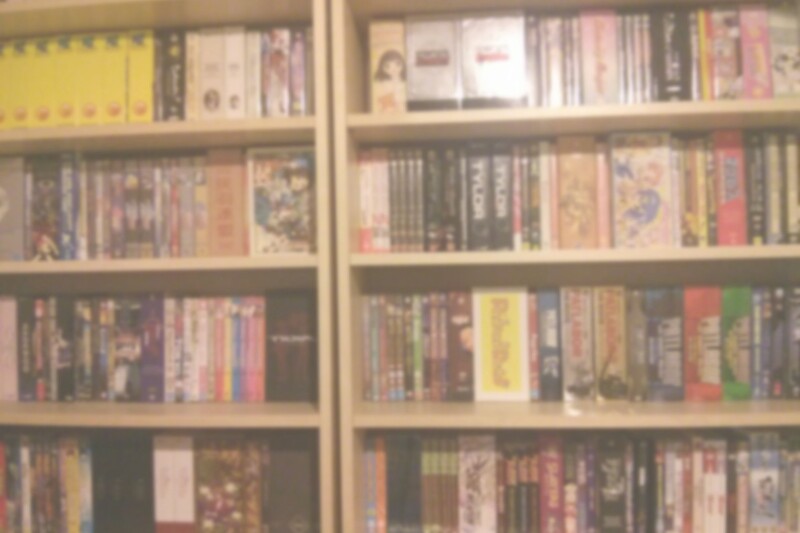 So yeah I thought one thing I could do here is kinda show off some of the anime stuff I’ve got. 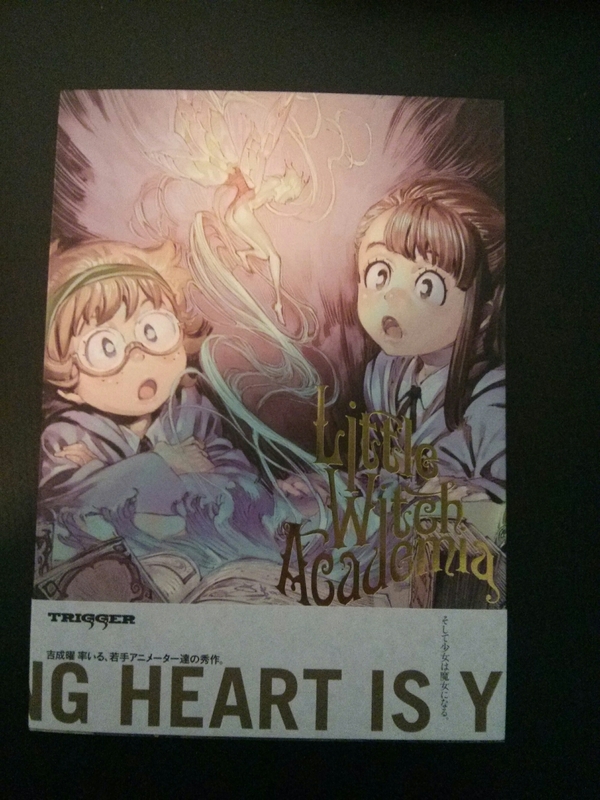 I’m starting off with the Blu-ray release of Little Witch Academia that I bought from the Trigger Online Store. A bit of background, since I think this site might still be at the “friends and family” level of popularity and I know a lot of my friends and family: Trigger is a studio founded by former staff of the once-great animation studio Gainax (of Evangelion fame), in particular Hiroyuki Imaishi, who directed Gurren Lagann, and those who worked with/under him. Little Witch Academia is a short film they produced with funding from the Japanese government’s Anime Mirai project, with the intent of providing training for young animators. Director Yoh Yoshinari had previously worked as a key animator on several high-profile shows, but this was his first project as director. There’s a lot of detail about the whole production process in the “making-of” feature on the Blu-ray, if you feel like making the same poor life choices as I do. As for the anime itself, the best way I can think of to describe it is “Anime Harry Potter”. Anyway, let’s look at some photos of pretty things! The discs themselves are housed in this cardboard case folder thingy. It’s wonderfully classy looking and feeling… in general the stuff in this set has a matte finish because that looks classier I guess. It’s like a sort of “nice looking and classy but not flashy or commercial” vibe. 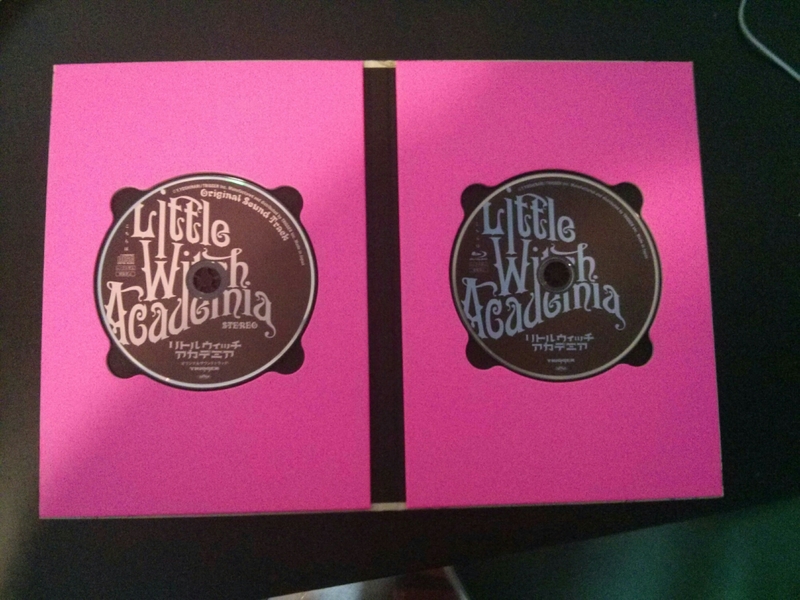 The discs inside are held on little plastic holders, surrounded by an interestingly garish bright pink card surround. I would have thought they might have continued the subdued feel from the outside, but this is quite visually striking and maybe that’s what they were going for. 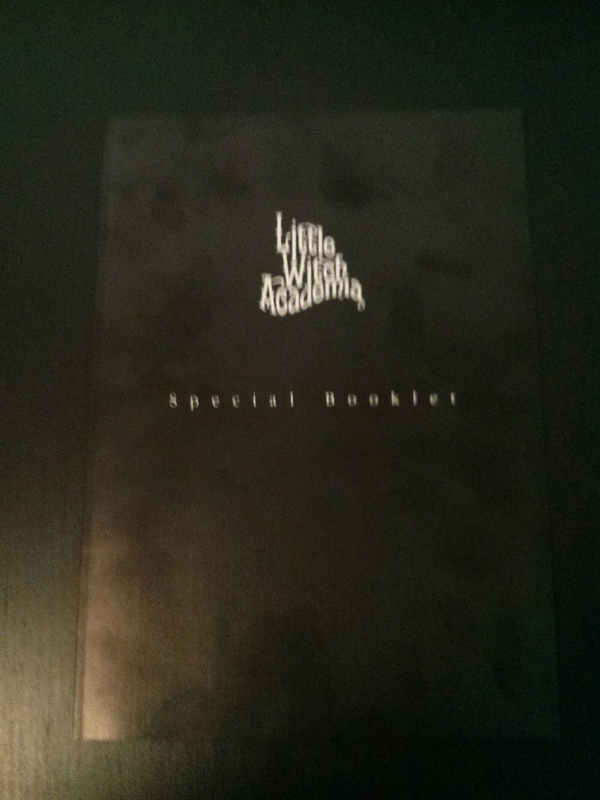 As well as the discs, we’ve also got the art book! 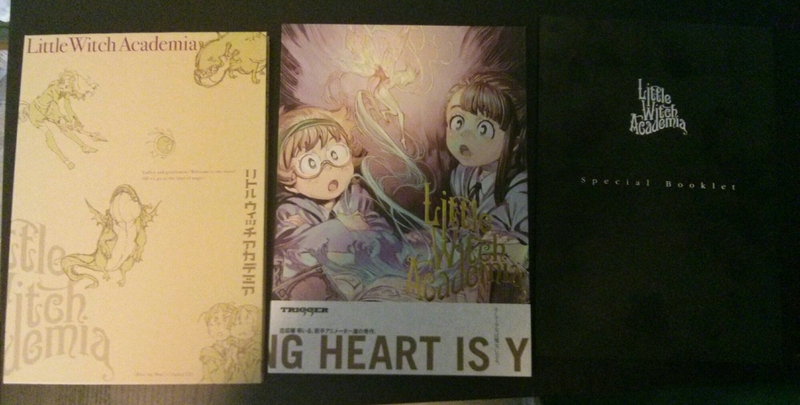 The cover is cool, it’s got this lovely full-colour piece of art of the three main characters with the title in gold leaf. 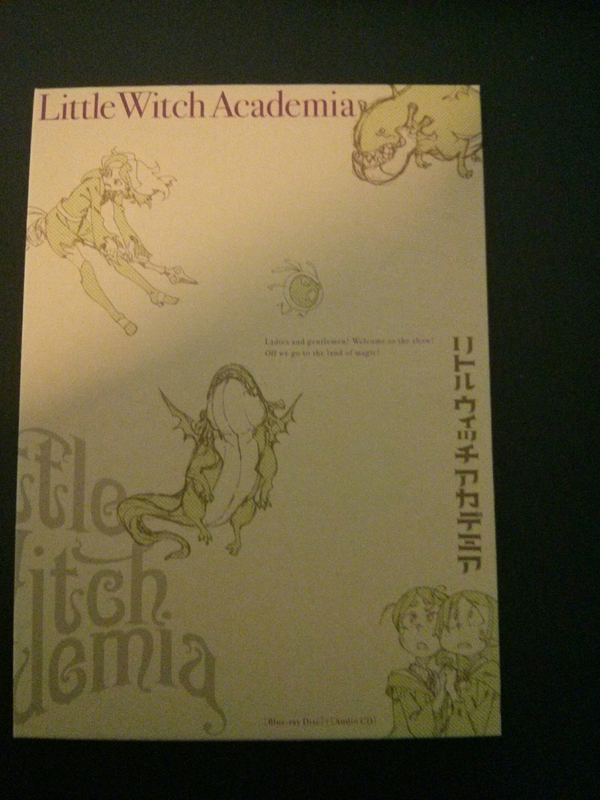 Although there’s no dust jacket, the cover has inside flaps that fold out (I’m informed these are called ‘french flaps’). There’s also the obi strip along the bottom, which features some entertaining use of the English language. Gotta love the gratuitous use of interesting English on Japanese products, right? 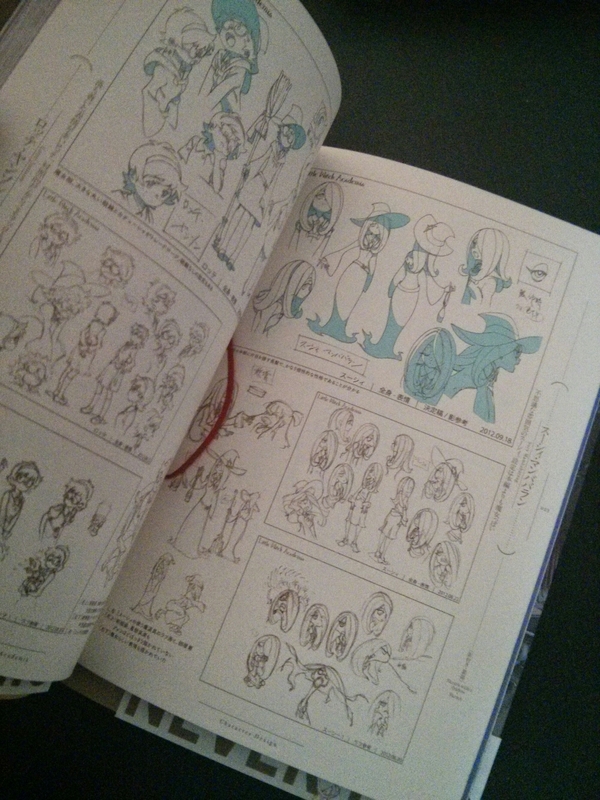 Inside the book, there’s loads of interviews (in Japanese) and design sketches and storyboards and stuff. It even has one of those ribbons that classy books have to help the reader keep their place. 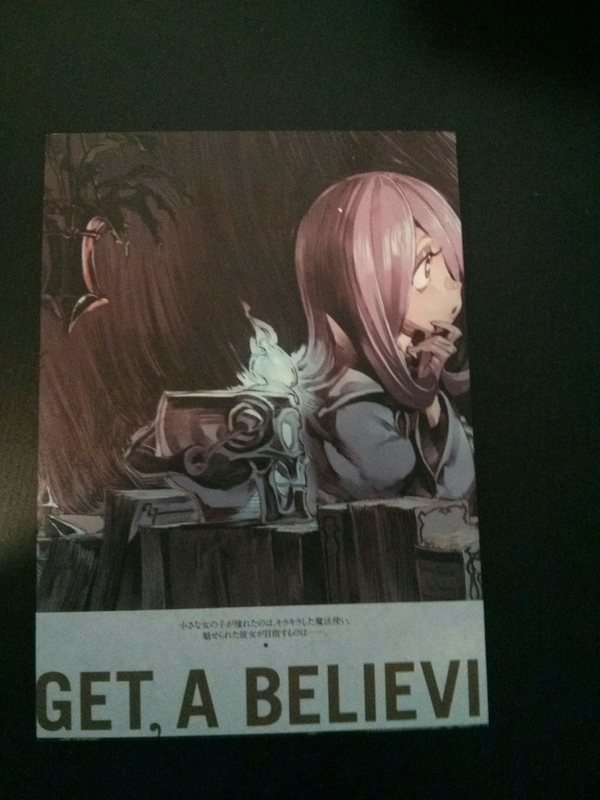 This is a fancy feeling book. And the pages have purple on the edges so the edge of the book all looks purple! 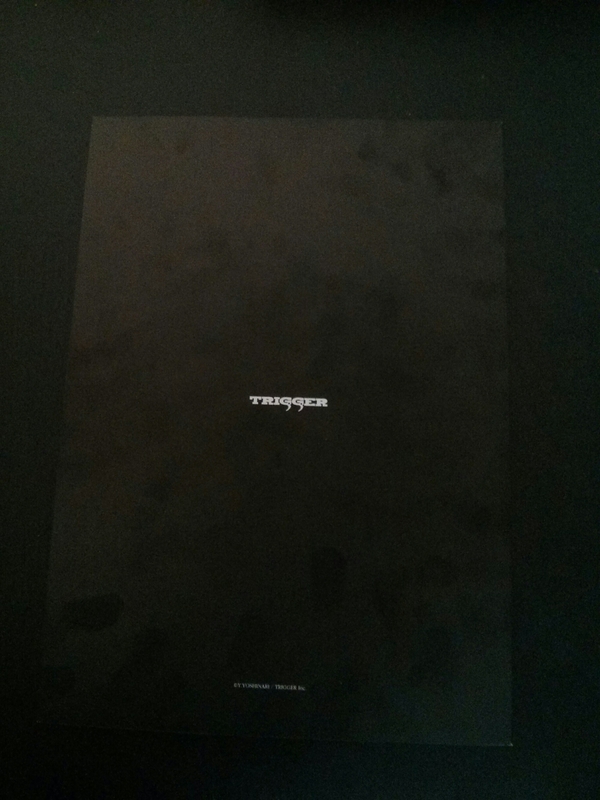 For those of us who are somewhat linguistically challenged when it comes to Japanese, and therefore are unable to get the full enjoyment from that there fancy artbook, the thoughtful folks at Trigger have provided a solution! 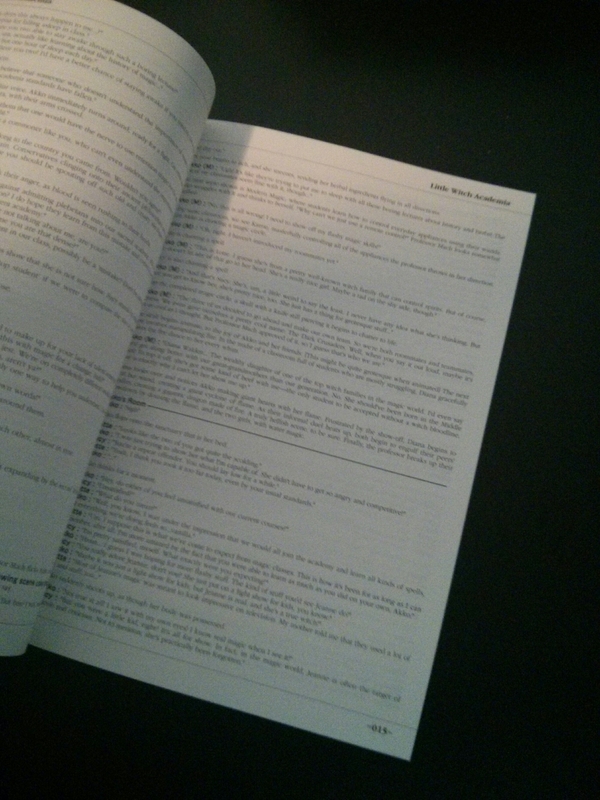 That’s right, there’s an extra book that translates all the text in the first book! This is a pretty common solution for these export-friendly premium Japanese anime blu-ray dealios, and it’s pretty nice, although admittedly a bit inconvenient to read both in parallel. See, there’s all the translated words and stuff. Even this part of the set is surprisingly classy feeling… the cover’s got this textured feel to it, although it does seem to attract fingerprints quite badly. 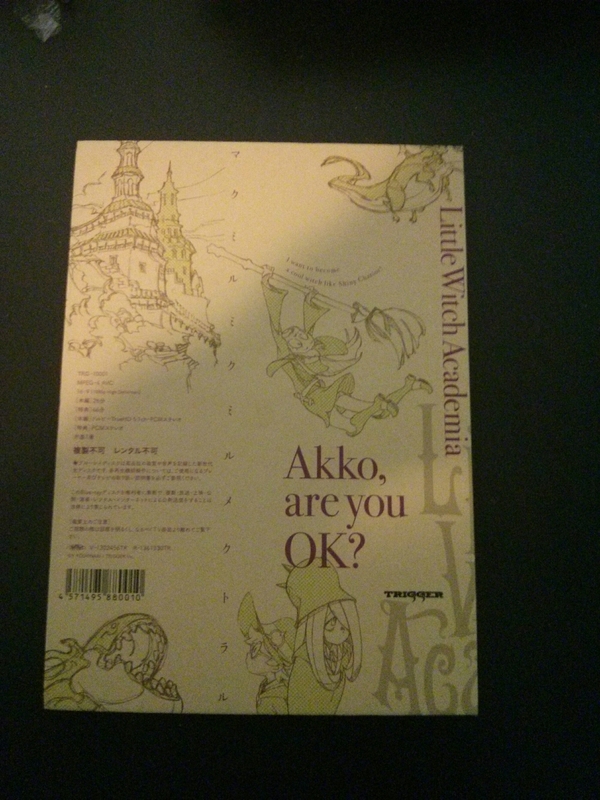 So yeah, that’s a thing I bought. It’s a really cool package for a cool little thing. And I kickstarted the sequel, so it’ll probably be getting a friend to sit alongside it in the “why oh why are these things taller than regular dvd cases” section of my anime shelves. Thanks for reading. 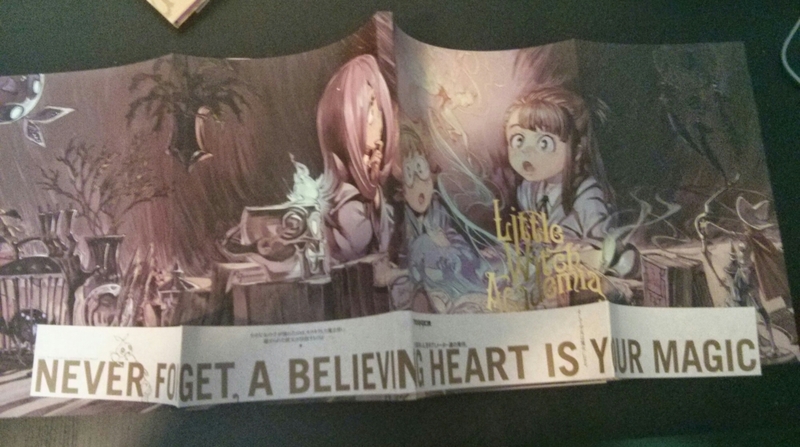 And never forget, a believing heart is your magic!